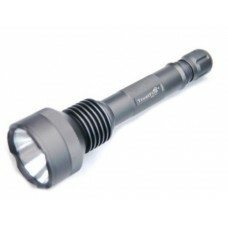 This Trustfire flashlight has an SSC P7 emitter and operates on 2 pieces of Lithium Ion 18650 batteries. This light is very well constructed with great output around 350 lumen constant output with good heat sinking keeping the operating temperatures low. There are 3 operational modes with mode memory (High/Low/Fast Strobe). Power is switched by fully depressing the reverse clicky tail switch and modes are changed by partially depressing the tail switch while the light is powere on. With mode memory, this light resumes operation in the last used mode when powered on and will not switch unless the power is interupted with in the first 3 seconds of operation. This light has a powerful and constant output, the beam is very smooth with moderate throw and spill, this is neither excessively floody or excessivly focused for long throw.